This bibliography—with an introduction—is available as an ebook from Barnes & Noble, Kobo, and amazon.com. published: New York, New York: Protestant Episcopal Society for the Promotion of Evangelical Knowledge, 1851-after 1867; publisher at 11 Bible House, Astor Place. • 1853, printed by J. A. Gray, 97 Cliff St.
• 1858, printed by John A. Gray, 16 & 18 Jacot St.
• Checklist of Children’s Books, 1837-1876, comp. Barbara Maxwell. Philadelphia, Pennsylvania: Special Collections, Central Children’s Department, Free Library of Philadelphia, 1975.
published: New York, New York: Lane & Scott, 1851-1853? • New York, New York: Carlton & Phillips, 1854-? ; 1854, publisher at 200 Mulberry St.
• “Introduction.” The Youth’s Monitor 1 (Jan 1851); pp. 5-6. • Notice #22. The Methodist Quarterly Review 5 (Jan 1853); p. 142. 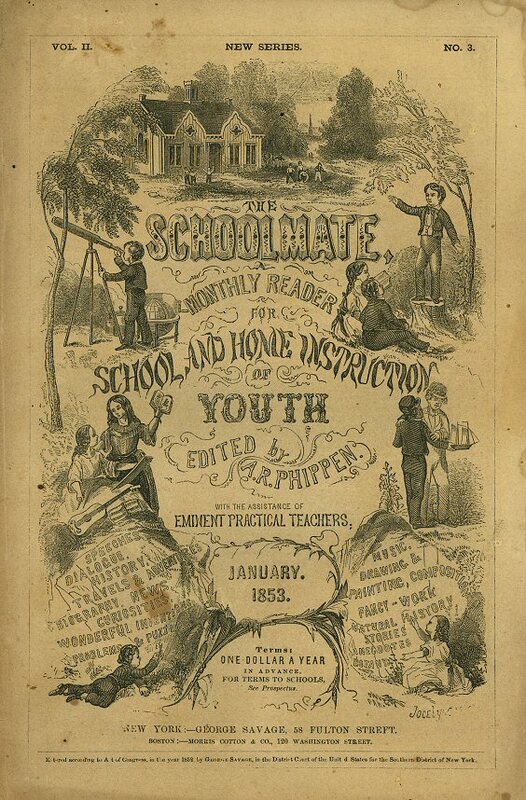 • “Periodicals for Youth.” Sunday School Advocate 13 (Feb 11, 1854): 78. • “Youth’s Monitor for 1854.” Sunday School Advocate 13 (March 11, 1854); p. 93. Youth’s Gem and Southern Cadet ; Jan 1851-? published: Macon, Georgia: J. C. Reagan. • notice. Southern Lady’s Companion. 4 (Jan 1851); p. 2. • Bertram Holland Flanders. 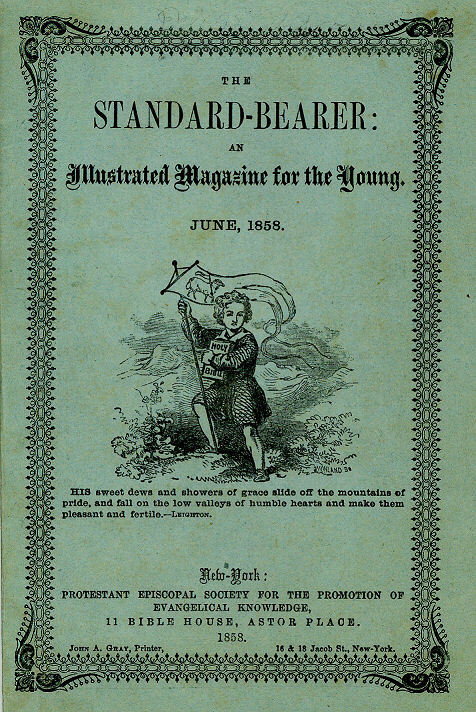 Early Georgia Magazines: Literary Periodicals to 1865. N.p. : The University of Georgia Press, 1944; p. 92.
published: New York, New York: B. B. Hallock, Jan 1851-1859. 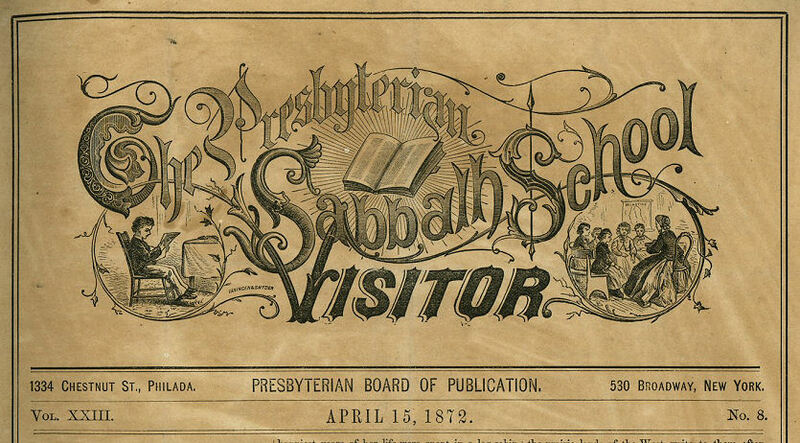 • Cincinnati, Ohio: N.p., Jan 1851-1859.
published: Philadelphia, Pennsylvania: Presbyterian Board of Publication; 1855-March 1857, publisher at 265 Chestnut St.; April 1857-1873, publisher at 821 Chestnut St. Philadelphia, Pennsylvania: Sabbath School Union. New York, New York: Presbyterian Board of Publication; 1855-Aug 1856, publisher at 285 Broadway; Jan 1857-1873, publisher at 530 Broadway; 1861, publisher at 15 Chatham Square. • “General Assembly (Old School).” New York Observer and Chronicle 29 (5 June 1851); pp. 1-2; mention on page 2. • Notice of The Youth’s Visitor. New York Observer and Chronicle 31 (29 Dec 1853); p. 414. • Notice of The Youth’s Visitor. German Reformed Messenger 19 (8 February 1854); p. 4035. • “Old School Presbyterian General Assembly.” Charleston Courier [Charleston, South Carolina] 54 (26 May 1856); p. 1. • “General Assembly.” New York Observer and Chronicle 34 (29 May 1856); p. 172. • “The Presidency and the New Element of Religion—Additional Newspaper Statistics.” The New York Herald [New York, New York] 26 Sept 1856: 4. • Advertisement. The Biblical Repertory and Princeton Review 32 (April 1860); p. 389. • “Presbyterian General Assembly.” Alexandria Gazette [Alexandria, Virginia] 24 May 1861: 2. • Advertisement. New York Evangelist 39 (9 Jan 1868); p. 7. • “The Presbyterian General Assemblies: The East.” Jackson Citizen [Jackson, Michigan] 25 May 1869: 1. • “Philadelphia Letter.” New York Evangelist 42 (14 Dec 1871); p. 2. • Barbara Snedeker Bates. “Denominational Periodicals: The Invisible Literature.” Phaedrus 7 (Spring/Summer 1980); pp. 13-18.
published: Rochester, New York: O. R. L. Crozier; publisher at the “office of the Advent Harbinger, Talman Block, opposite the Arcade”. published: Boston, Massachusetts: J. M. Usher; 1852, 1861, publisher at 37 Cornhill. • Boston, Massachusetts: Universalist Publishing House, 1865-1876. • L. B. Fisher. A Brief History of the Universalist Church, for Young People, 4th ed., revised. N.p. : N.p., n.d.; p. 169. • Russell E. Miller. The Larger Hope: The First Century of the Universalist Church in America, 1770-1870. Boston, Massachusetts: Unitarian Universalist Association, 1979; vol 1, p. 560. • “The Student and Flower-Basket United.” The Student 4 (April 1852); p. 185. • Betty Longenecker Lyon. “A History of Children’s Secular Magazines Published in the United States from 1789-1899.” PhD diss. Johns Hopkins, 1942; pp. 225.
source of information: mentioned in The Western Gem, and Musician 4 (Sept 1852); p. 36.
edited by: J. Mitchell, jr.
published: Little Rock, AR: J. Mitchell, jr.
• Notice. The Genius of Youth 1 (1 June 1852); p. 7.
published: Little Rock, AR: J. C. Mitchell • Little Rock, AR: J. G. Mitchel & W. T. Robinson, 1853.
published: Washington, DC: Review & Herald Publ. Association. • Washington, DC: Seventh-Day Adventists, 1936. • Irving Garwood. American Periodicals from 1850 to 1860. Macomb, Illinois: Irving Garwood, 1931. • Gertrude C. Gilmer. Checklist of Southern Periodicals to 1861. Boston, Massachusetts: F. W. Faxon Company, 1934; p. 65. The Child’s Paper ; Jan 1852-1897? published: New York, New York: American Tract Society, 1852-1897? ; 1861, publisher at 150 Nassau St.
• Boston, Massachusetts: N. P. Kemp, Nov 1854-Dec 1855; publisher at 28 Cornhill, Nov 1854-Dec 1855; publisher at 40 Cornhill, 1864-1867. Boston, Massachusetts: H. E. Simmons, 1870-1871; publisher at 116 Washington St.
description: 4 pp. ; page size, 14″ h x 9 5/8″ w • Price, 1854-1855, 1857-April 1864: “payable in advance, in packages of not less than ten copies,” 10/$1 (10¢ ea); 50/$4.50 (9¢ ea); 100/$8 (8¢ ea). • In 1860, stories from the Paper were published as Flowers of Spring Time (American Tract Society). • “The American Tract Society.” German Reformed Messenger 17 (24 Dec 1851); p. 3398. • “The American Tract Society.” The Independent 4 (13 May 1852); p. 78. • “The American Tract Society.” The Christian Observer 32 (14 May 1853); p. 78. • “The American Tract Society.” The Missionary Magazine 35 (Aug 1855); p. 370. • “The American Tract Society.” German Reformed Messenger 21 (14 May 1856); p. 4306. • “The American Tract Society.” German Reformed Messenger 22 (20 May 1857); p. 2. • “The American Tract Society.” German Reformed Messenger 23 (26 May 1858); p. 2. • “The American Tract Society, Boston.” The Liberator 28 (10 Dec 1858); p. 198. • “The American Tract Society.” New York Evangelist 30 (19 May 1859); p. 2. • “Tract House On Fire.” New York Observer and Chronicle 37 (15 Dec 1859); p. 398. • Bucer. “ ‘The Tract Journal’ and ‘Child at Home,’ vs. ‘American Messenger’ and the [‘]Child’s Paper;’ or Boston vs. New York.” German Reformed Messenger 25 (27 June 1860); p. 2. • Zwingli. “The Schism in the American Tract Society.” German Reformed Messenger 25 (11 July 1860); p. 1. • Notice of Flowers of Spring Time. New York Observer and Chronicle 38 (13 Dec 1860); p. 394. • “The American Tract Society.” New York Evangelist 33 (14 May 1863); p. 8. • “American Tract Society.” New York Evangelist 35 (19 May 1864); p. 2. • “The Slave Mother.” Friends’ Review 18 (8 Oct 1864); pp. 87-88. • “Reduction of Terms.” The Children’s Friend (Richmond, Virginia) 21 Dec 1867: p. 95. • “American Tract Society.” The Ladies’s Repository 29 (Aug 1868); p. 156. • “Help those that need Help.” New York Evangelist 39 (6 Aug 1868); p. 4. • Notice. Christian World 23 (June 1872); p. 199.
published: Buffalo, New York: Beadle & Vanduzee, Jan 1852-March 1853; printed by Phinney & Co.
• Buffalo, New York: Beadle & Brother, April 1853-Nov 1853. • Buffalo, New York: E. F. Beadle, Dec 1853-Dec 1855. • Buffalo, New York: Beadle & Adams, Jan 1856-1857. • Notice. The Buffalo Morning Express. 31 Dec 1851. • Notice. Western Literary Cabinet 9 (Nov 1853); p. 160. • Notice. Michigan Journal of Education and Teachers’ Magazine 1 (July 1854); p. 240. • Notice. German Reformed Messenger 20 (20 Dec 1854); p. 4214. • Advertisement. Prisoner’s Friend 9 (1 Nov 1856); p. 86. • Frank H. Severance. “Bibliography: The Periodical Press in Buffalo, 1811-1915,” Buffalo Historical Society Publications 19 (1915); pp. 177-312. • Betty Longenecker Lyon. “A History of Children’s Secular Magazines Published in the United States from 1789-1899.” PhD diss. Johns Hopkins, 1942; pp. 209-213. • Albert Johannsen. The House of Beadle and Adams. Norman, OK: University of Oklahoma Press, 1950; vol 1, pp. 414-418. • Children’s Periodicals of the United States, ed. R. Gordon Kelly. Westport, Connecticut & London, England: Greenwood Press, 1984.
published: New York, New York: George Savage, Feb 1852-Jan 1854; 1852, Savage at 22 John St.; later, Savage at 58 Fulton St.
• Boston, Massachusetts: Morris Cotton & Co., Dec 1852-Aug 1854; Cotton at 120 Washington St.
• A. R. Phippen may have taken over as publisher in Feb 1854: “The editor of the Schoolmate having taken the office formerly occupied by George Savage, will, in future, give strict attention to editing and publishing the magazine. 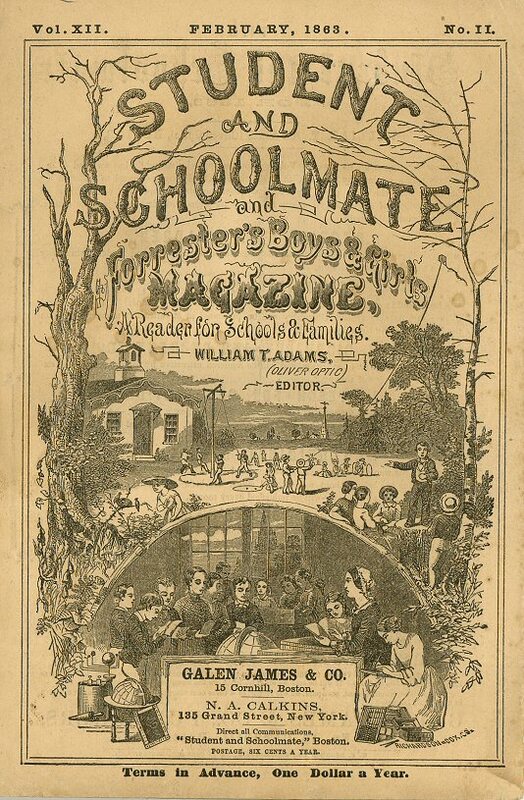 The delay which has been so troublesome in some of the late numbers, will be avoided, and our subscribers will have their magazines mailed to them by, at least, the first of each month.” [Schoolmate. 3 (Jan 1854); p. 92] The Jan 1854 issue lists George Savage as the New York publisher. • “Editor’s Table.” Maine Farmer 20 (11 March 1852); p. 2. • “Periodicals.” The Ladies’ Repository 12 (May 1852); p. 198. • Notice. Spirit of the Times 22 (26 June 1852); p. 228. • Advertisement. The Huntress 16 (7 Jan 1854); p. 4.
published: New York, New York: Thaddeus Hyatt, Daniel H. Jacques, April-Sept 1852; publisher at 97 Cliff St.
description: 32 pp. ; page size, 9.5″ h; price, $1/ year • Lyon states that the last issue was Oct 1852. • “Editor’s Table.” Maine Farmer 26 (24 June 1852); p. 2. • Dorothy Dechert. “The Merry Family: A Study of Merry’s Museum, 1841-1872, and of the Various Periodicals that Merged with It.” Master’s thesis. Columbia University, 1942. • Betty Longenecker Lyon. “A History of Children’s Secular Magazines Published in the United States from 1789-1899.” PhD diss. Johns Hopkins, 1942; pp. 29-32. • Perhaps named after The Genius of the West, a periodical for adults published by Howard Durham in Cincinnati, Ohio. • Like older publishers, Alley offered premiums, in this case for works on temperance written by young writers. • Alley appears to have reinvented his periodical each time his family moved to a new town. • Emma King-Benham. Memorial Volume to the Boy, Pioneer-Poet-Printer Ross Alley. Terre Haute, Indiana: N.p., 1929. Printed by the Viquesney Company; pp. 35-36, 61-79. Youth’s Instructor ; Aug 1852-1970 • Insight ; 1970-present? published: Rochester, New York: Review & Herald Publishing Association, 1852-1855. • Battlecreek, Michigan: Review & Herald Publishing Association, 1855-1903.
published: Buffalo, New York: Conrad Bär. • Karl J. R. Arndt & May E. Olson. German-American Newspapers and Periodicals: 1732-1955. Heidelberg: Quelle & Meyer Publishers, 1961. • Sybille Fraser. “German Language Children’s and Youth Periodicals in North America: A Checklist.” Phaedrus 6 (Spring 1979); pp. 27-31. • Betty Longenecker Lyon. “A History of Children’s Secular Magazines Published in the United States from 1789-1899.” PhD diss. Johns Hopkins, 1942; pp. 144.
published: Cincinnati, Ohio: J. C. Richardson & Co.
published: New York, New York: Benjamin Ela; Jan 1853, publisher at 116 Nassau St.; March 1853, publisher at 185 Nassau St.
• New York, New York: E. H. Fletcher; publisher at 117 Nassau St.
• Lyon describes two copies in different states: “In an undated copy at the Rare Book Room, Library of Congress, the publisher is given as Benjamin Ela of New York. A duplicate volume in the New York Public Library is dated 1854, and the publisher is given as E. H. Fletcher.” [p. 145] The undated copy published by Ela appears to be the 1853 original; the 1854 copy published by Fletcher is probably a reprint. • “End of vol. 1” is printed at the bottom of the last page of my copy of the 1854 edition; however, no later volumes have been located. • Advertisement. New York Evangelist 24 (6 Jan 1853); p. 3. • Notice. The Independent 5 (17 March 1853); p. 42. • Advertisement. The Independent 5 (17 March 1853); p. 44. • Betty Longenecker Lyon. “A History of Children’s Secular Magazines Published in the United States from 1789-1899.” PhD diss. Johns Hopkins, 1942; pp. 144-145.
published: Philadelphia, Pennsylvania: Leander K. Lippincott; 1861, publisher at 319 Walnut St.
• 1853-1856: 8 pp. ; quarto; page size, 12.75″ h x 9″ w; price, 50¢/ year. relevant information: Though the Pilgrim began in Oct 1853, the Lippincotts preferred to begin each volume with the January issue; thus, both the Oct 1853 and Jan 1854 issues are marked “Vol. I No. 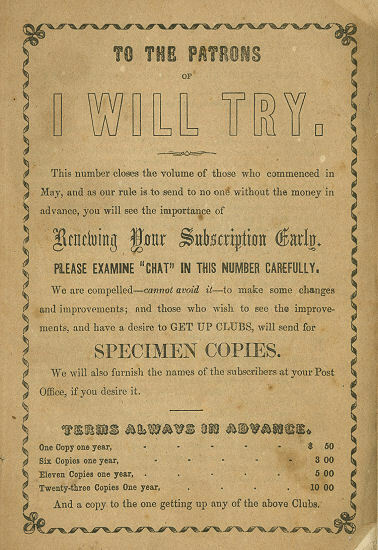 1.” The last few issues for 1854 reminded those who had subscribed in Oct-Dec 1853 that not only was it time to renew, but that since their new subscription would begin with the issue for Jan 1855, they needed to include extra money for the Oct-Dec 1854 issues. Thus a subscriber renewing in Oct 1854 should send money for 15 issues (62¢, instead of 50¢); a renewal in Nov 1854 should be for 14 issues, etc. • The connection between periodicals was confusing to at least one editor: “It is said to be a continuation of the Friend of Youth, lately published in Washington by Mrs. Bailey; but we can’t quite see how that is, when it has another name, another place of publication, and another editor.” [“The Little Pilgrim.” The National Era 7 (3 Nov 1853); p. 174] That the Pilgrim began a year after the Friend ended probably didn’t help. • microfilm: Nineteenth-Century Children’s Periodicals. Westport, Connecticut: Greenwood Press, 1979. • excerpts in Lessons of War: The Civil War in Children’s Magazines, ed. James Marten. Wilmington, Delaware: Scholarly Resources, 1998. • Advertisement. The National Era 7 (8 Sept 1853); p. 143. • Notice. Western Literary Cabinet 9 (Nov 1853); p. 159. • “The Little Pilgrim.” The National Era 7 (3 Nov 1853); p. 174. 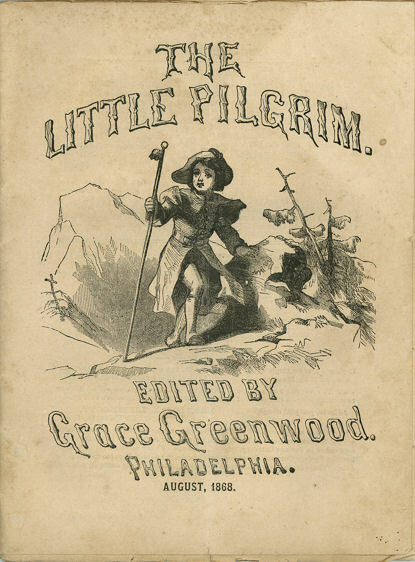 • “The Little Pilgrim.” Graham’s American Monthly Magazine 43 (Dec 1853); p. 653. • Notice. The Knickerbocker 42 (Dec 1853); p. 654-655. • Notice. Michigan Farmer 11 (1 Dec 1853); p. 369. • Notice. Godey’s Lady’s Book Jan 1854; p. 80. • “Grace Greenwood.” American Phrenological Journal 19 (Jan 1854); p. 5-8. • “L.” [Leander Lippincott] “The Friend of Youth.” The Little Pilgrim 1 (March 1854); p. 21. • “Editors’ Table.” Peterson’s Magazine 27 (April 1855); p. 316. • Notice. The Knickerbocker 46 (Dec 1855); p. 655. • Advertisement. American Phrenological Journal 22 (Dec 1855); p. 139. • “Literary Notices.” Home Journal 48 (1 Dec 1855); p. 3. • “Our New Shape.” The Little Pilgrim 4 (Jan 1857); p. 8. • Notice. Maine Farmer 27 (15 Dec 1859); p. 2. • Notice. Maine Farmer 30 (11 Dec 1862); p. 2. • Notice. Maine Farmer 33 (7 Dec 1865); p. 2. • Notice. Southern Cultivator 25 (Oct 1867); p. 329. • Notice of sale. American Literary Gazette and Publishers’ Circular 13 (1 June 1869); p. 55. 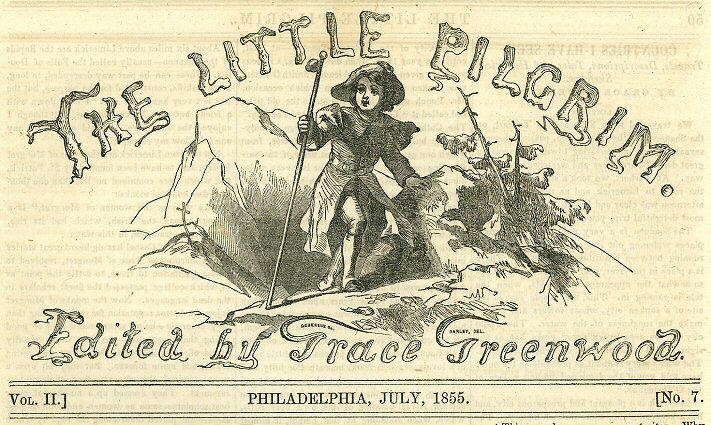 • “Grace Greenwood.” [Sarah J. Lippincott] “A Mother’s Good Bye.” The Little Corporal, 8 (June 1869); p. 91. 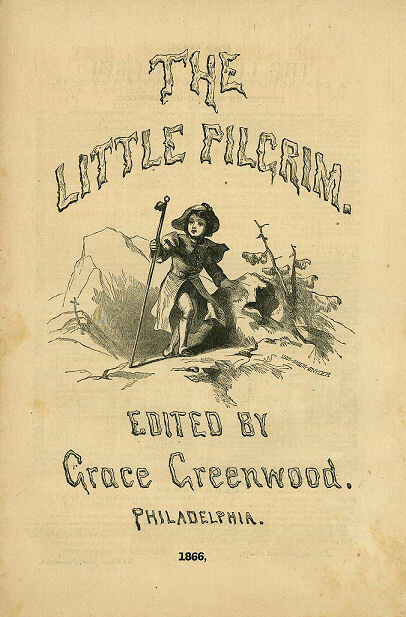 • “The Little Pilgrim: A Distinguished Recruit.” The Little Corporal, 8 (June 1869); p. 92. • Notice of merger. Western Christian Advocate 36 (23 June 1869); 197. • Eleanor Weakley Nolen. 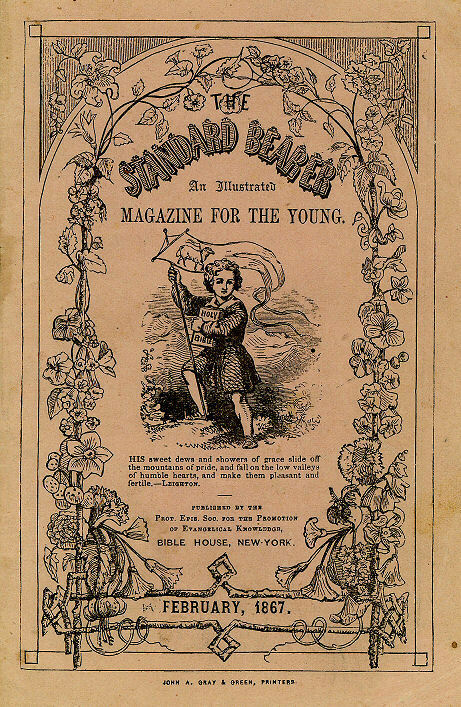 “Nineteenth Century Children’s Magazines.” The Horn Book Magazine. 15 (January/February 1939); p. 55-60. • Mabel F. Altstetter. “Early American Magazines for Children.” Peabody Journal of Education 19 (Nov 1941); p. 132. • Betty Longenecker Lyon. “A History of Children’s Secular Magazines Published in the United States from 1789-1899.” PhD diss. Johns Hopkins, 1942; pp. 214-220. • James Marten. 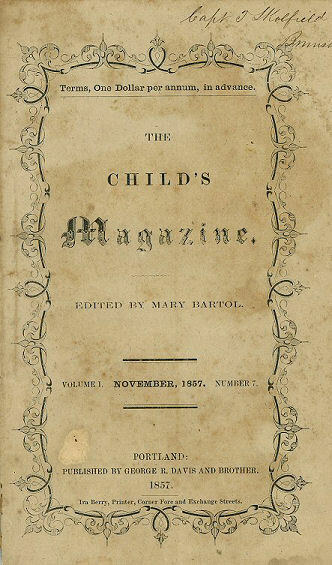 “For the Good, the True, and the Beautiful: Northern Children’s Magazines and the Civil War.” Civil War History 41 (March 1995); p. 57-75. • Lessons of War: The Civil War in Children’s Magazines, ed. James Marten. Wilmington, Delaware: Scholarly Resources, 1998.
relevant information: In May 1854, a specimen issue was sent to subscribers to the Western Literary Cabinet, which was edited by Mrs. Sheldon. • “The Little Wolverine.” Western Literary Cabinet 10 (May 1854); p. 198. • Notice. Odd Fellows’ Literary Casket 1 (June 1854); p. 382. • Silas Farmer. History of Detroit and Wayne County and Early Michigan, 3rd ed. Detroit: Silas Farmer & Co., 1890; p. 677. • Betty Longenecker Lyon. “A History of Children’s Secular Magazines Published in the United States from 1789-1899.” PhD diss. Johns Hopkins, 1942; pp. 145-146, 151.
published: Dayton, Ohio: Telescope Office, 1854-1904. • Dayton, Ohio: S. Vonnieda. • Dayton, Ohio: W. J. Shuey, 1869-1872.
available: excerpts in Lessons of War: The Civil War in Children’s Magazines, ed. James Marten. Wilmington, Delaware: Scholarly Resources, 1998.
published: Cincinnati, Ohio: Howard Durham, Jan-July 1854. • Cincinnati, Ohio: C. S. Abbott & Co., Aug 1854. • Cincinnati, Ohio: William T. Coggeshall, Sept 1854-1855. • “Literary Notices.” Western Literary Cabinet 10 (March 1854); 120. 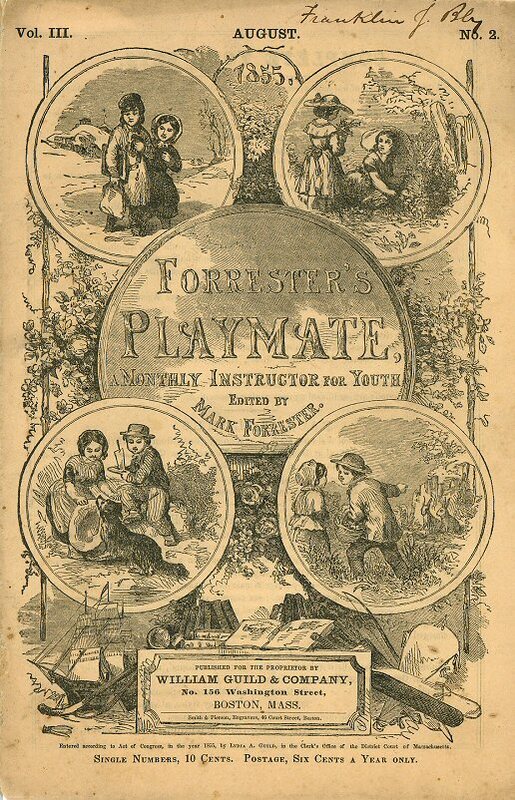 • “To the ‘Little Forester’ Subscribers.” The Youth’s Friend 10 (Jan 1856); p. 60. • W. H. Venable. “Early Periodical Literature of the Ohio Valley,” part 5. Magazine of Western History 8 (Oct 1888); p. 523. • Irving Garwood. American Periodicals from 1850 to 1860. Macomb, Illinois: Irving Garwood, 1931; p. 24. • Betty Longenecker Lyon. “A History of Children’s Secular Magazines Published in the United States from 1789-1899.” PhD diss. Johns Hopkins, 1942; pp. 146-147. • “Schuylkill County School Journal.” German Reformed Messenger 19 (4 Jan 1854); p. 4014. • “Educational Periodicals.” The Connecticut Common School Journal and Annals of Education 1 (May 1854); p. 156.
published: Brunswick, Maine: Howard Owen. • Betty Longenecker Lyon. “A History of Children’s Secular Magazines Published in the United States from 1789-1899.” PhD diss. Johns Hopkins, 1942; pp. 146.
published: Boston, Massachusetts: William Guild & Co., 1854-1867. Publisher at 156 Washington St., Aug 1855-Feb 1860; at 109 Washington St., April-Aug 1860; at 5 Water St., Aug 1862; at 15 Water St., July 1864-April 1865; at 33 School St., May 1865-Feb 1867; at 134 Washington St., April 1867. • “Editor’s Table.” Maine Farmer 22 (22 June 1854); p. 2. • “Editor’s Table.” Maine Farmer 23 (14 June 1855); p. 2. • Advertisement. German Reformed Messenger 22 (7 Jan 1857); p. 4. • “Editor’s Table.” Maine Farmer 25 (11 June 1857); p. 2. • Advertisement. New York Evangelist 31 (5 Jan 1860); p. 5. • Betty Longenecker Lyon. “A History of Children’s Secular Magazines Published in the United States from 1789-1899.” PhD diss. Johns Hopkins, 1942; pp. 221-223.
published: Cincinnati, Ohio: Howard Durham. • Business for the Traveler was handled by John W. Henley. published: Cincinnati, Ohio: Carl Beyschlag. published: Nashville, Tennessee: South-Western Publishing House, Graves, Marks & Co., Jan 1855-1860. • Three notices. Tennessee Baptist 11 (17 Feb 1855); p. 2. • Mary D. Manning. “ ‘Trust Not Appearances’: Admonitory Pieces from Two Tennessee Juvenile Periodicals of the 1850s.” University of Mississippi Studies in English. 5 (1984-1987); p. 131-139. • Material from the daily was collected into the weekly. • The young publishers had previous experience as students of the Ogdensburg Academy, having helped publish the Morning Glory and Young America. continued by: The Daily Journal (The Ogdensburg Journal) ; The Weekly Journal. 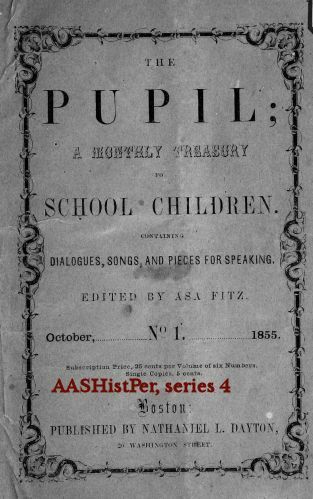 The Pupil: A Monthly Treasury for School Children ; Oct 1855-March 1856? published: Boston, Massachusetts: Nathaniel L. Dayton; publisher at 20 Washington St.
• Descriptions of the magazine in the Harvard and New York Public Library online catalogs refer to a notice tipped into the last issue that with volume 2 the publisher would be changed to Higgins & Bradley. • Issues may have been reprinted in 1856 as The Pupil’s Cabinet: A Treasury for Children, by Asa Fitz (Boston, Massachusetts: Higgins and Bradley, 1856); the height of the book is the same as that of the magazine. • The last issue listed in online catalogs is issue 5.
edited by: Nov 1855-1856, A. R. Phippen; Norman A. Calkins. • 1857-1862, Norman A. Calkins; A. R. Pope, associate ed. • 1858-1862, Norman A. Calkins; Francis Forrester (“Father Forrester”) & William T. Adams (“Oliver Optic”), associate ed. • 1858-1862, Francis Forrester, associate ed. • 1861-1864, William T. Adams. • 1864-1872, Joseph H. Allen. published: New York, New York: Calkins & Stiles, Nov 1855-July 1858; publisher at 348 Broadway, 1856-1858. New York, New York: N. A. Calkins, Aug 1858-June 1864; publisher at 348 Broadway, Aug 1858-Feb 1860; publisher at 135 Grand St., Jan 1861-April 1864; publisher at 130 Grand St., May-June 1864. New York, New York: Schermerhorn, Bancroft, & Co., Aug-Dec 1864. New York, New York: American News Co., Feb-Nov 1867. • Boston, Massachusetts: James Robinson, Nov 1855-1856? Boston, Massachusetts: Robinson and Richardson, 1856-April 1857. Boston, Massachusetts: James Robinson & Co., June 1857-Oct 1859; publisher at 119 Washington St., 1857-Oct 1859. April 1858-Nov 1859, printed by George C. Rand & Avery, 3 Cornhill. Boston, Massachusetts: Robinson, Greene & Co., Nov 1859-Feb 1860; publisher at 120 Washington St., Nov 1859-Feb 1860. Boston, Massachusetts: Galen James & Co., 1861-1863; publisher at 15 Cornhill. Boston, Massachusetts: Joseph H. Allen, 1864-1872; publisher at 119 Washington St., 1864; publisher at 203 Washington St., 1867-1869.
variations: Individual issues show a surprising number of differences. • Notice. Prisoner's Friend 8 (1 Feb 1856); p. 165. • Advertisement. The Independent 12 (5 Jan 1860); p. 7. • Notice. 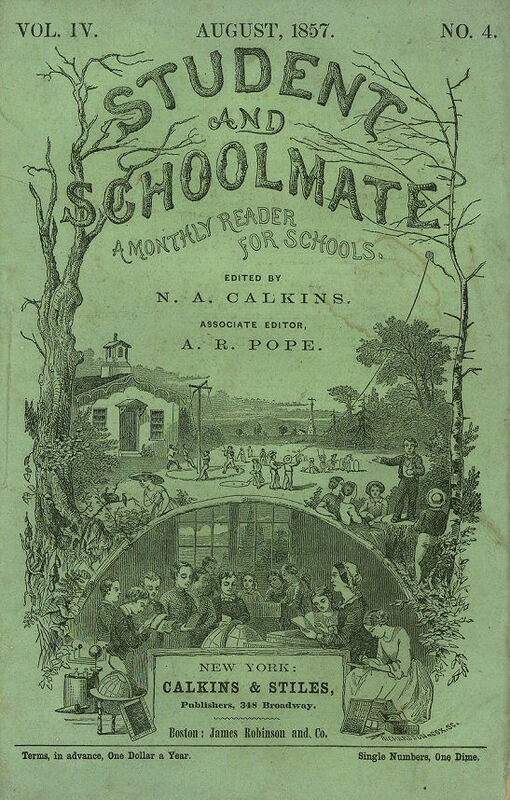 Massachusetts Teacher and Journal of Home and School Education 16 (June 1863); p. 219. • Notice. Urbana Union 2 (2 Sept 1863); p. 1, col 2. 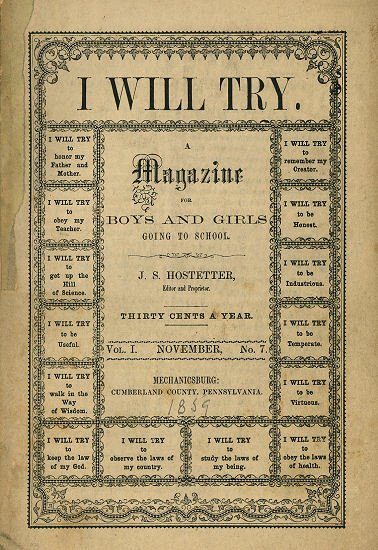 • “Magazines for the Young.” Massachusetts Teacher and Journal of Home and School Education 23 (Jan 1870); p. 37-38. • Harriet L. Matthews. “Children’s Magazines.” Bulletin of Bibliography. 1 (April 1899); p. 133-136. • Betty Longenecker Lyon. “A History of Children’s Secular Magazines Published in the United States from 1789-1899.” PhD diss. Johns Hopkins, 1942; pp. 224-228. Die Glocke (The bell) • Sonntagschul Glocke (Sunday-school bell); about 1856-1900? published: Cincinnati, Ohio: L. Swormstedt & A. Poe, 1856-7 June 1860. • Cincinnati, Ohio: A. Poe & L. Hitchcock, 14 June 1860-1865? • Cincinnati, Ohio: Hitchcock & Walden, 1866?-July? 1880. • “Editor’s Table: Business of the Western Book Concern.” The Ladies’ Repository 17 (April 1857); p. 256. • “Literary Notices: Our Periodical Press.” The Ladies’ Repository 17 (Dec 1857); p. 757. • “Literary, Scientific, and Statistical Items: Sunday School Periodicals.” The Ladies’ Repository 21 (May 1861); p. 313. • The Ladies’ Repository, in 1861, lists the place of publication as Bremen. • Apparently this is the periodical listed as Christliche Vunderfreund in the report of the 1868 General Conference. • “ ‘May I Beg You, Please, Sir?’ ”—from the Kinderfreund— was published in the Zion’s Herald and Wesleyan Journal (19 Sept 1866). • “General Conference of 1868.” Western Christian Advocate 35 (27 May 1868); p. 169.
published: Philadelphia, Pennsylvania: Norwood Penrose Hallowell. published: West Chester, Pennsylvania: G. M. Dilworth, 1856-1857; at the “office of the Republican & Democrat, North High Street, next door to Agricultural Warehouse” • West Chester, Pennsylvania: S. L. Tucker, 1858. • May-July 1857 contains the only serial to appear in the periodical: “A Villain Foiled,” by D. C. M. F. X. V.
published: Syracuse, New York: Adam Crooks, 1869-1872.
published: Philadelphia, Pennsylvania: August Pohlig & Co.; 1870-1872, office at 54 N. 6th St.
• Cleveland, Ohio: Deutsches Verlagshaus. • OCLC describes a copy which is 15 volumes in one; beginning date is 1857; Arndt lists a beginning date of 1858, but questions it; therefore, I have listed the beginning date as 1857. • “The ‘Laemmerhirte.’ ” German Reformed Messenger 31 (14 Feb 1866); p. 2.
published: New York, New York: Edward H. Fletcher; publisher at 29 Ann St.
frequency: “monthly”: my bound copy apparently has 24 issues, with 8 issues in volume 1 and 16 issues in vol 2. 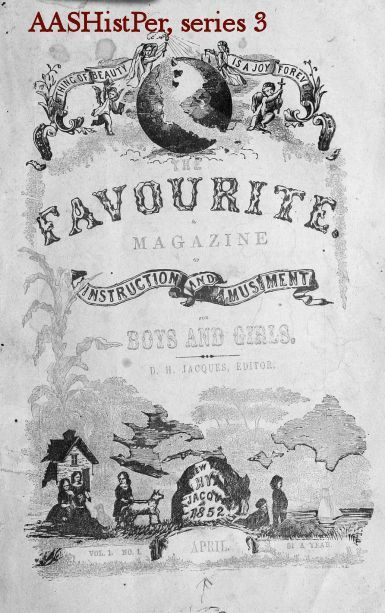 • Stereotyped pages from the original Parley’s Magazine were reprinted inside elaborate borders which enlarge the page size to match that of other children’s magazines of the 1850s. In the bound volume, unnumbered pages containing editorial material are added to individual issues. • “This Magazine is just what its title purports:—1st. A re-print of the old Parley’s Magazine excepting some articles of a temporary or local character, relating to the time when they were published: 2nd. New Matter, Editorials, &c., by the present Editor (’Uncle Stephen.’) That Parley’s Magazine was the best work of the kind that has ever been published is so palpable as to need no demonstration. In re-editing, every thing valuable in ‘modern improvement,’ will be availed of, and a work presented that on the whole shall give back to the subscribers a full equivalent for his little outlay.” [title page] The final product is a quilt of 20-year-old material ham-handedly fitted together, with a few pieces from the 1850s added. published: Roxbury, Massachusetts: Reed & Gardner; publisher at corner of Centre St. and Smith St.
• Betty Longenecker Lyon. “A History of Children’s Secular Magazines Published in the United States from 1789-1899.” PhD diss. Johns Hopkins, 1942; pp. 147. Young Reaper • The Young Reaper ; Jan 1857-1908? edited by: B. Griffith • B. Griffith and A. E. Dickinson, Jan 1871-? 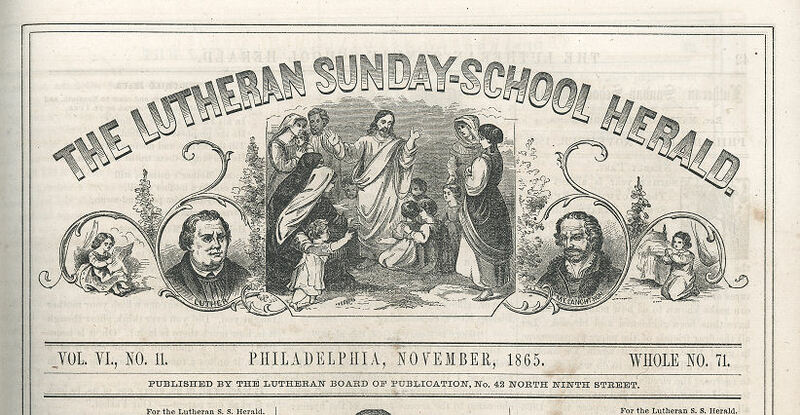 published: Philadelphia, Pennsylvania: American Baptist Publication Society, Jan 1857-1908? 1857, publisher at 118 Arch St.; 1869-1871, publisher at 530 Arch St. • Boston, Massachusetts: American Baptist Publication Society, 1857; publisher at 79 Cornhill. • New York, New York: American Baptist Publication Society, 1869-1871; publisher at 76 E. Ninth St. • Chicago, Illinois: American Baptist Publication Society, 1869-1871; July-Aug 1869, publisher at 38 Lombard Block; Sept 1869-March 1871, publisher at 7 Custom House Place • St. Louis, Missouri: American Baptist Publication Society, 1869-1871; publisher at 209 N. Ninth St.
• Advertisement. Christian Secretary 35 (26 Dec 1856); p. 3. • “American Baptist Publication Society.” The Missionary Magazine 37 (Sept 1857); p. 346. • Daniel W. Stowell. Rebuilding Zion: The Religious Reconstruction of the South, 1863-1877. New York: Oxford University Press, 1998; p. 120-121, 227. • Witherell edited Uncle Ezekiel’s Youth’s Cabinet (May 1844-15 March 1846? ), published in Concord, New Hampshire. After moving his family to Maine, Witherell opened a printing shop and published The Gem and Literary Gazette for adults. In 1857, the front page of the Gem bore an amusing resemblance to that of the Cabinet, with the same borders, the same font in the masthead, and the same “Poet’s Boudoir” at the top of column one. • Regularly advertised in the Gem in 1857, the Cabinet is not mentioned in issues for 1859; probably it had folded. 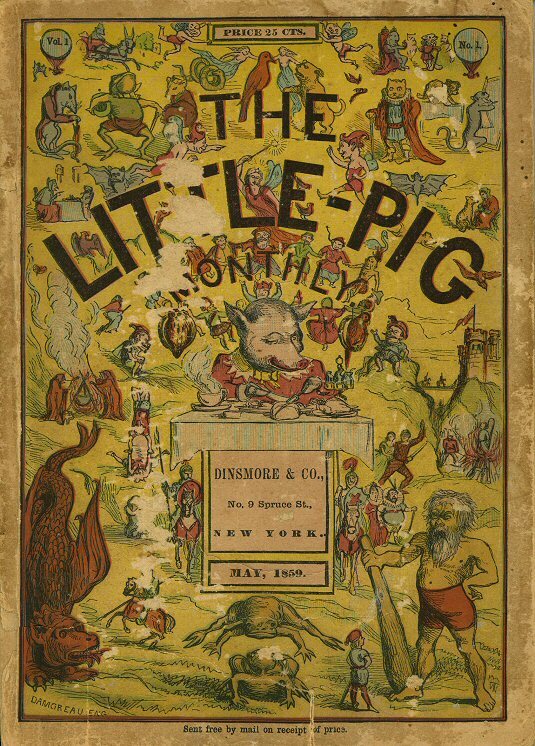 • “The Little Joker” was a regular column in The Gem and Literary Gazette. • The names and addresses of subscribers were published in each issue. The 100 subscribers listed in the June 1857 issue were mostly from Maine; a handful of subscribers were from Massachusetts, and one was from Grand Rapids, Michigan. • New subscribers were promised a veritable avalanche of premiums, distributed in a complex method. Premiums included “Ten Bound Volumes Little Joker” (an illustrated collection of humorous stories which may have appeared originally in the Gem), “Ten Bound Volumes Youth’s Cabinet” (a 92-page collection of stories, poems, and other pieces which may have appeared earlier in Uncle Ezekiel’s Youth’s Cabinet), and one year of The Schoolfellow. Unfortunately for Witherell, the Schoolfellow merged with Robert Merry’s Museum in September 1857. • Advertisement. Maine Farmer 25 (16 April 1857); p. 3.
edited by: 1 April 1857-1868, Alexander Clark. • 1867, William Clark (“Uncle Charlie”); Emily R. Freeman. • Philadelphia, Pennsylvania: J. W. Daughaday, 1860-1875; 1867, publisher at 1308 Chestnut St.
Philadelphia, Pennsylvania: Daughaday & Becker, 1869; publisher at 424 Walnut St.
Philadelphia, Pennsylvania: J. W. Daughaday & Co., 1872; publisher at 434 and 436 Walnut St.
description: 1860: 8 pp. 1864: 16 pp. ; octavo; price, 50¢/ year. • In 1872, an engraving of “Uncle Charlie” was made available as a premium for subscribers; a copy of the engraving was printed on page 331 of the December 1872 issue. • Notice. Massachusetts Teacher and Journal of Home and School Education 12 (Nov 1859); p. 442. • “Book Notices.” The Connecticut Common School Journal and Annals of Education 7 (Feb 1860); p. 64. • Advertisement. The Youth’s Companion 34 (15 March 1860); p. 43. • Advertisement. The Youth’s Companion 34 (27 Sept 1860); p. 155. • Advertisement. The Independent (15 Nov 1860); p. 8. • Advertisement. The Connecticut Common School Journal and Annals of Education 8 (Dec 1861); p. 390. • Advertisement. American Phrenological Journal 36 (Dec 1862); p. 134. • “Book Notices.” The Connecticut Common School Journal and Annals of Education 10 (Jan 1863); p. 30. • “Alexander Clark.” American Phrenological Journal 37 (April 1863); p. 85. • Advertisement. American Phrenological Journal 37 (April 1863); p. 94. • “Book Notices.” Massachusetts Teacher and Journal of Home and School Education 16 (June 1863); p. 220. • Advertisement. The Liberator 34 (1 Jan 1864); p. 3. • “Literary Notices.” American Educational Monthly 1 (March 1864); p. 96. • “Book Notices.” The Connecticut Common School Journal and Annals of Education 11 (July 1864); 219. • Advertisement. The Round Table 4 (17 Nov 1866); p. 250. 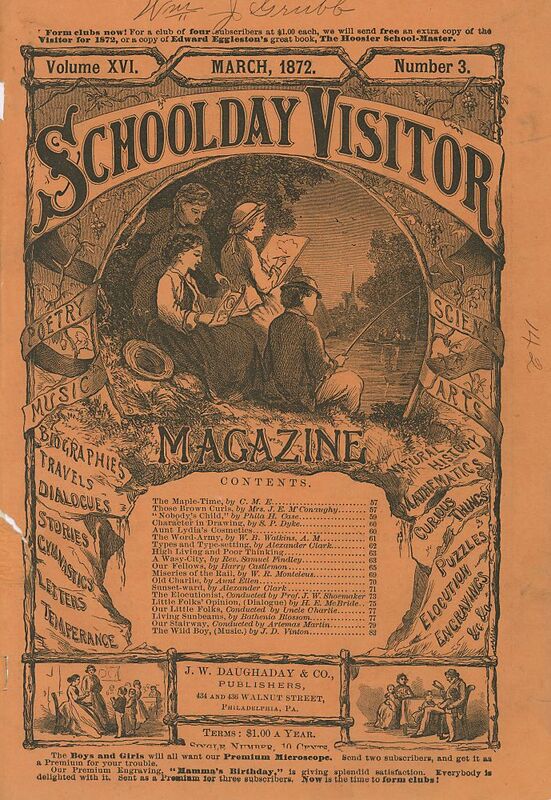 • “Our Schoolday Visitor.” American Phrenological Journal 45 (Jan 1867); p. 30. • Advertisement. Godey’s Lady’s Book and Magazine 74 (Jan 1867); p. 105. • Advertisement. Godey’s Lady’s Book and Magazine 76 (Jan 1868); p. 109. • Review of The Gospel in the Trees. Zion’s Herald 46 (9 July 1868); 329. • Advertisement. Scientific American 20 (7 Oct 1868); 239. • Advertisement. The Independent 21 (28 Oct 1869); p. 6. • “The Publishers’ Department.” Herald of Health 15 (Jan 1870); p. 48. • Advertisement. New York Evangelist 43 (21 Nov 1872); p. 5. • Betty Longenecker Lyon. “A History of Children’s Secular Magazines Published in the United States from 1789-1899.” PhD diss. Johns Hopkins, 1942; pp. 229-235. • Notice. The Monthly Religious Magazine and Independent Journal 17 (May 1857); p. 368. • Review. The North American Review 85 (July 1857); p. 277. • “Editor’s Table.” Maine Farmer 26 (22 April 1858); p. 2. 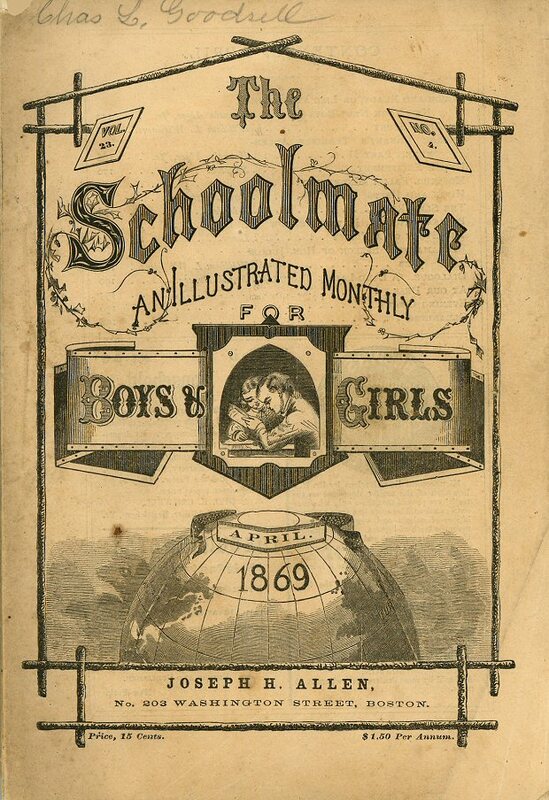 Boys’ Monthly Gazette ; May 1857-April 1858? published: Charleston, Massachusetts: James H. Lee. 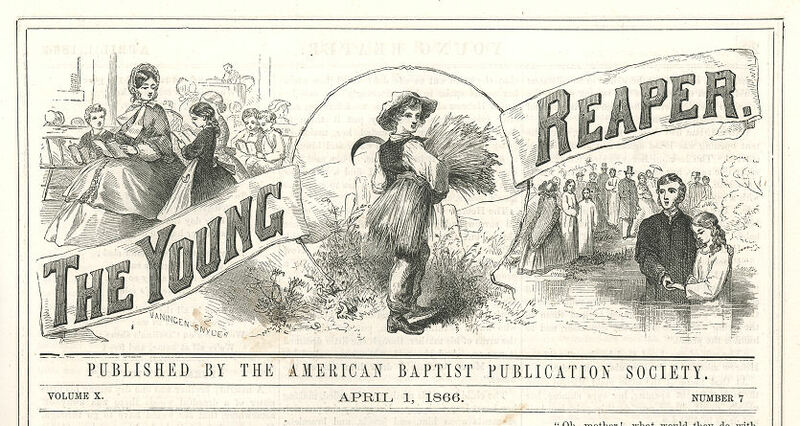 Young America ; June 1857-after June 1858? published: Cincinnati, Ohio: John Hageman. published: Baltimore, Maryland: J. Murphy. Baltimore, Maryland: John Murphy & Co.; 1861, publisher at 182 Baltimore St.
• Notice. Brownson’s Quarterly Review 2 (April 1861); p. 275. • Notice of Spare Hours. The Catholic World 2 (Feb 1866); p. 718. • Gertrude C. Gilmer. Checklist of Southern Periodicals to 1861. Boston, Massachusetts: F. W. Faxon Company, 1934; p. 24.
published: Brookline, Massachusetts: Sampson & Phillips. published: Boston, Massachusetts: S. H. Porter, 1858.
merged with: Young America Monthly Magazine (Jan-Dec 1858) to form Young America and Excelsior ; Feb-April 1859? published: Auburn, New York: Cayuga County Orphan Asylum Board of Managers, 1866. • Auburn, New York: Cayuga Asylum for Destitute Children, 1882. The Young Christian Soldier ; 1858-1881? 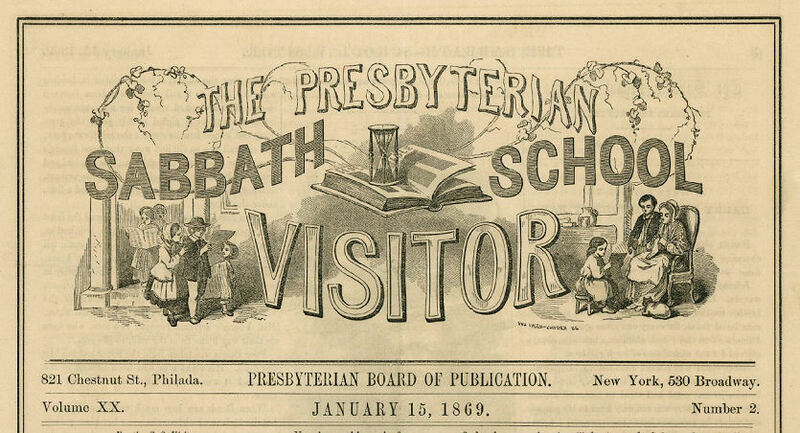 published: New York, New York: Domestic Missions, Protestant Episcopal Church; 1869-1872, publisher at 17 Bible House. published: Boston, Massachusetts: Epes Sargent; publisher at 289 Washington St., 1858? 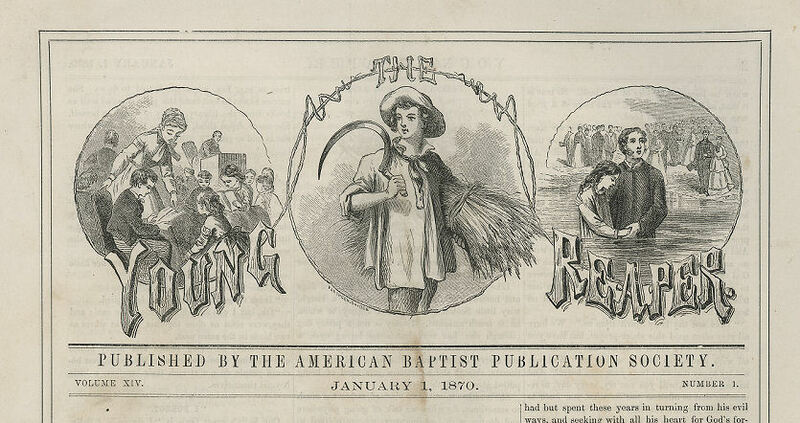 relevant information: The contents for the May 1858 issue was published in The Monthly Religious Magazine and Independent Journal (19 [May 1858]: 5). • “Books Received During the Month of December.” Massachusetts Teacher and Journal of Home and School Education 11 (Jan 1858); p. 40. • Advertisement. The Monthly Religious Magazine and Independent Journal 19 (May 1858); p. 5. • “Recent Pamphlets.” Christian Register 12 (21 Aug 1858); p. 1. • Notice. Forrester’s Playmate. 9 (Dec 1858); p. 189. • Betty Longenecker Lyon. “A History of Children’s Secular Magazines Published in the United States from 1789-1899.” PhD diss. Johns Hopkins, 1942; p. 147.
published: Boston, Massachusetts: Richardson & Andrews. • Boston, Massachusetts: W. G. Reed & J. B. Gardner. merged with: The Excelsior (1858) to form Young America and Excelsior ; Feb-April 1859? published: Cincinnati, Ohio: J. K. Alpaugh, 15 July-Dec 1858. • “Literary Notices.” The Ladies’ Repository 18 (Sept 1858); p. 570.
published: Rockland, Maine: Z. Pope Vose. published: Pittsburgh, Pennsylvania: George B. Russell, 1859-June 1865. • Philadelphia, Pennsylvania: S. R. Fisher & Co., July 1865-after 1867; 1865, publisher at 54 N. 6th St.
• Philadelphia, Pennsylvania: Board of Publication of the Reformed Church, 1869-1872; publisher at 54 N. 6th St.
• Lancaster County, Pennsylvania: Darius William Gerhard, 1888-after 1903. • “The Pastor’s Helper.” German Reformed Messenger 24 (12 Jan 1859); p. 2. • “The Pastor’s Helper.” German Reformed Messenger 24 (9 March 1859); p. 2. • “Our Sunday School Papers.” German Reformed Messenger 24 (11 May 1859); p. 2. • “ ‘The Pastor’s Helper.’ ” German Reformed Messenger 24 (18 May 1859); p. 3. • “ ‘The Pastor’s Helper.’ ” German Reformed Messenger 25 (18 Jan 1860); p. 3. • “A Helper.” German Reformed Messenger 26 (10 July 1861); p. 2. • “The Pastor’s Helper.” German Reformed Messenger 27 (1 Jan 1862); p. 3. • Advertisement. 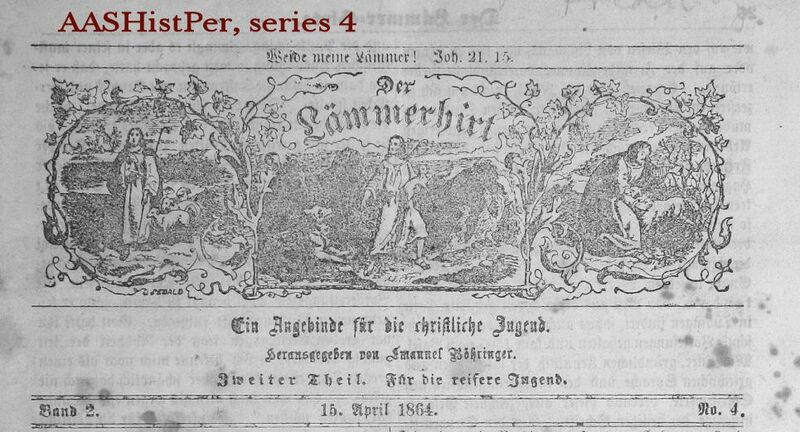 German Reformed Messenger 28 (18 March 1863); p. 3. • “The Pastor’s Helper.” German Reformed Messenger 28 (25 March 1863); p. 1. • “The Pastor’s Helper—Vol. VII.” German Reformed Messenger 30 (11 Jan 1865); p. 3. • “The Pastor’s Helper.” German Reformed Messenger 30 (28 June 1865); p. 2. • “The Pastor’s Helper.” German Reformed Messenger 30 (12 July 1865); p. 2. • “The Child’s Treasury.” German Reformed Messenger 30 (19 July 1865); p. 2. • “Write for The Child’s Treasury.” German Reformed Messenger 30 (16 Aug 1865); p. 2. • Advertisement. German Reformed Messenger 30 (23 Aug 1865); p. 4. • “The Child’s Treasury.” German Reformed Messenger 30 (23 Aug 1865); p. 2. • “Child’s Treasury.” German Reformed Messenger 31 (20 Sept 1865); p. 3. • “Our Child’s Paper.” German Reformed Messenger 31 (4 Oct 1865); p. 2. • “Partnership and Sole-Ownership.” German Reformed Messenger 31 (11 Oct 1865); p. 2. • “The Child’s Treasury in Families.” German Reformed Messenger 31 (3 Jan 1866); p. 2. • “Is It Right?” German Reformed Messenger 31 (3 Jan 1866); p. 2. • “Is It Possible!” German Reformed Messenger 31 (23 May 1866); p. 3. • “Notices of Periodicals.” German Reformed Messenger 32 (3 July 1867); p. 3. • Notice of death of Henry Harbaugh. Reformed Church Messenger 33 (15 Jan 1868); p. 4. • “Martinsburg, Pennsylvania.” Reformed Church Messenger 34 (20 Jan 1869); p. 5. • “The ‘Child’s Treasury.’ ” Reformed Church Messenger 37 (4 Jan 1871); p. 4. • G. “The Children’s Paper.” Reformed Church Messenger 37 (4 Jan 1871); p. 5. • “The Child’s Treasury.” Reformed Church Messenger 37 (18 Oct 1871); p. 1. • “The Child’s Treasury.” Reformed Church Messenger 38 (17 Jan 1872); p. 4. • Advertisement. Messenger 47 (25 Dec 1878); p. 5. • Appletons’ Cyclopaedia of American Biography, ed. James Grant Wilson and John Fiske. New York: D. Appleton and Company, 1887; vol 3: 76-77. • “Newspaporial.” Maine Farmer 26 (21 Oct 1858); p. 2. • Notice of second issue. Maine Evangelist 4 (12 Feb 1859); p. 2. • “A Paper for the Young Folks.” Maine Farmer 27 (7 April 1859); p. 2. • “Notices of Books.” Maine Teacher 1 (May 1859); p. 378; copy at archive.org. • Cyrus Eaton. History of Thomaston, Rockland, and South Thomaston, Maine. Hallowell: Masters, Smith & Co., 1865; vol 2, p. 33; copy online at Making of America. published: Baltimore, Maryland: A. O. Brickmann. • Betty Longenecker Lyon. “A History of Children’s Secular Magazines Published in the United States from 1789-1899.” PhD diss. Johns Hopkins, 1942; pp. 148.
published: New York, New York: William L. Jones; in 1860, at 152 Sixth Ave.
• “Pamphlets Received.” New York Evangelist 31 (19 July 1860); p. 8. • Advertisement. New York Evangelist 29 (16 Dec 1858); p. 7. • Advertisement. New York Evangelist 30 (13 Jan 1859); p. 7. • Advertisement. New York Observer and Chronicle 39 (3 Jan 1861); p. 7. • Advertisement for The Child’s World. The Danville Quarterly Review 1 (Dec 1861); p. 3. Youth’s Evangelist • The Youth’s Evangelist ; Jan 1859-1930? published: Cincinnati, Ohio: R. H. Pollock, G. W. Gowdy, R. D. Harper, & J. P. Smart, 1859. • Cincinnati, Ohio: R. H. Pollock and G. W. Gowdy, May 1860-Feb 1861; 1860, publisher at Taft’s Buildings, corner of Fourth and Vine. • Pittsburg, Pennsylvania: James M. Ferguson, late 1861. • Philadelphia, Pennsylvania: James M. Ferguson, 1862-1865; Jan 1862, publisher at P. O. Box 1865; April-July 1862, publisher at P. O. Box 518; 1865, publisher at 25 N. 6th St. or P. O. Box 901; 1872, publisher at 15 N. 7th St.
Young America and Excelsior ; Feb-April 1859? published: Edgewood, Maryland: Thomas Donaldson, jr; “Edgewood, near the ‘Relay House’ ”. The editor’s address was St. Denis P. O., Baltimore Co., Md. Printed at F. A. Hanzsche’s Book & Job Printing Establishment, 212 Baltimore St., near Charles. • Two-page supplements were published for the 1 Oct 1859 and 8 Oct 1859 issues. • Gertrude C. Gilmer. Checklist of Southern Periodicals to 1861. Boston, Massachusetts: F. W. Faxon Company, 1934; p. 63. • Advertising began to appear in volume 2, on the inside of the covers (cover page 2 and cover page 3). published: New York, New York: Dinsmore & Co.; publisher at 9 Spruce St.
• Boston, Massachusetts: Shepard, Clark & Brown; publisher at 110 Washington St.
description: Vol 1 #1 is marked “May” on the cover; inside front cover announces contents of July issue. 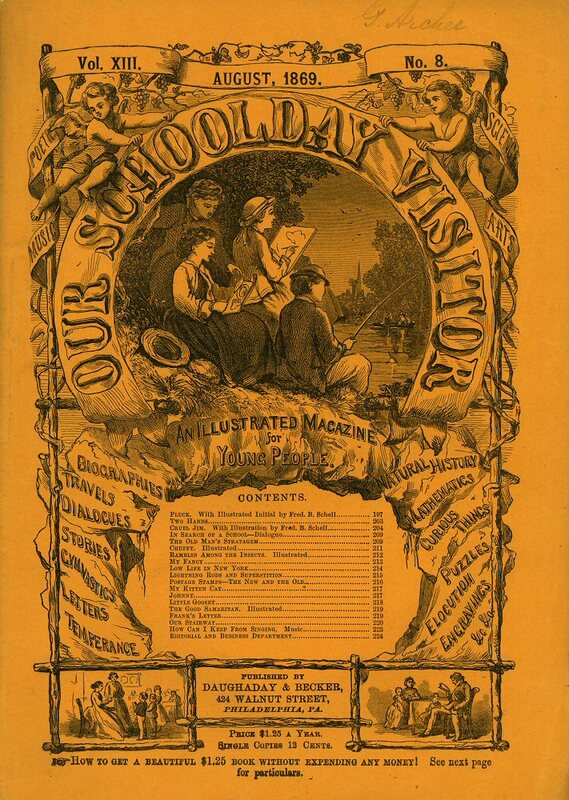 The Library of Congress has at its web site a scanned broadside advertising the magazine which describes the May issue as the “June number: Good for any month ”; its contents are those of the issue for May. relevant information: The May issue was referred to as the “June” issue in a broadside (see above); the July issue was the subject of a notice in the Sept 1859 issue of Godey’s. The publishers seem to have done what they could to stretch two issues of a monthly magazine to cover at least four months. • Notice of June issue: “New Announcements since our Last Issue.” American Publishers’ Circular and Literary Gazette 5 (4 June 1849); p. 271. • Advertisement. American Railway Times 11 (18 June 1859); p. 4. • Notice. Ballou’s Pictorial Drawing-Room Companion 17 (9 July 1859); p. 26. The Child at Home ; Dec 1859-1879? published: Boston, Massachusetts: N. Broughton, for the American Tract Society, 1861; publisher at 28 Cornhill; printed by George C. Rand & Avery, 3 Cornhill. Boston, Massachusetts: American Tract Society, 1870; publisher at 164 Tremont St.
• New York, New York: I. W. Brinckerhoff, for the American Tract Society, 1861; publisher at 13 Bible House, Astor Place. 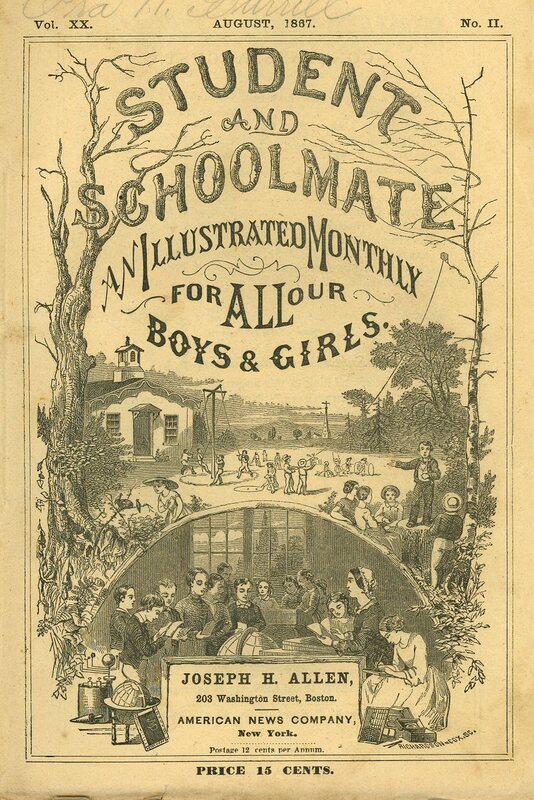 • Beginning in July 1864, the Child was available in either a “plain” or a “colored” edition: “We commence this month the publication of an edition of the Child at Home with COLORED ENGRAVINGS. The Heading and Large Cut of the first page are printed in from six to eight brilliant colors, making a paper having no equal in America for beauty and attractiveness. … Notwithstanding the great expensiveness of those colored engravings, and of their printing, we propose to put the price exceedingly low. … Any person now receiving the plain edition, may change it for the colored for the remainder of the year, by sending us twenty cents additional for each copy. 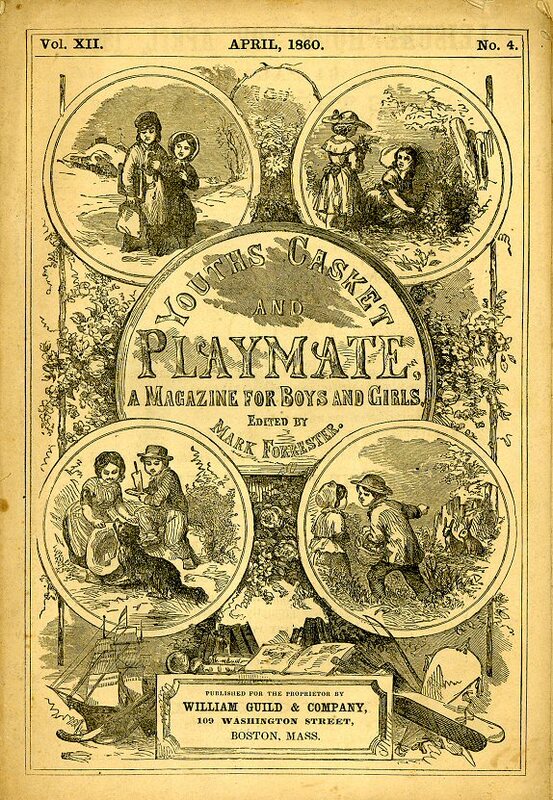 The plain edition will be continued as heretofore.” [“Colored Engravings!” Child at Home 5 (July 1864); p. 28] The masthead and front-page illustration were printed in red, blue, yellow, brown, and black. • Advertisement. New York Evangelist 30 (15 Dec 1859); p. 5. • “The Tract Journal and Child at Home.” The Independent 12 (5 Jan 1860); p. 4. • Bucer. “ ‘The Tract Journal’ and ‘Child at Home,’ vs. ‘American Messenger’ and ‘the Child’s Paper;’ or Boston vs. New York.” German Reformed Messenger 25 (27 June 1860); p. 2. • “American Tract Society, Boston.” New York Evangelist 33 (21 May 1863); p. 6. • “The American Tract Society, Boston.” New York Observer and Chronicle 46 (9 April 1868); p. 115. • Advertisement. The Missionary Magazine 50 (Dec 1870); p. 8. • Notice. Christian Union 4 (13 Dec 1871); p. 382. • Notice. Christian World 23 (June 1872; p. 199. • Rockland, Maine: Rich & Vose, 1872.
relevant information: A piece from the paper was reprinted in Band of Hope Record, a British temperance magazine. • Apparently realizing the popularity of subscriber-written puzzles, rebuses, and conundrums, in 1869, Vose wrote to successful puzzle-writers for at least one other periodical, offering a subscription to the Visitor as payment: “Applying recently to my friend the Assistant Editor of ‘Oliver Optic’s Magazine’, for the addresses of some of the best rebus-contributors to that mag., she recommended you to me, with two or three others. I send you this note to solicit that you will favor the Visitor with occasional contributions of rebuses, &, if disposed, of other kinds of ‘head-work’. On receiving a favorable response I shall be pleased to send you the Visitor free in return for your favors.” [letter from Z. Pope Vose to “Herbert.” 16 Dec 1869] “Head-work” was the title of the puzzles column for Oliver Optic’s Magazine (5 Jan 1867-Dec 1875). • Advertisement. Maine Farmer 27 (15 Dec 1859); p. 2. • Notice. The Maine Teacher and School Officer 6 (October 1863); p. 127. • Notice. Portsmouth Journal of Literature and Politics [Portsmouth, New Hampshire] 17 October 1863; p. 2. 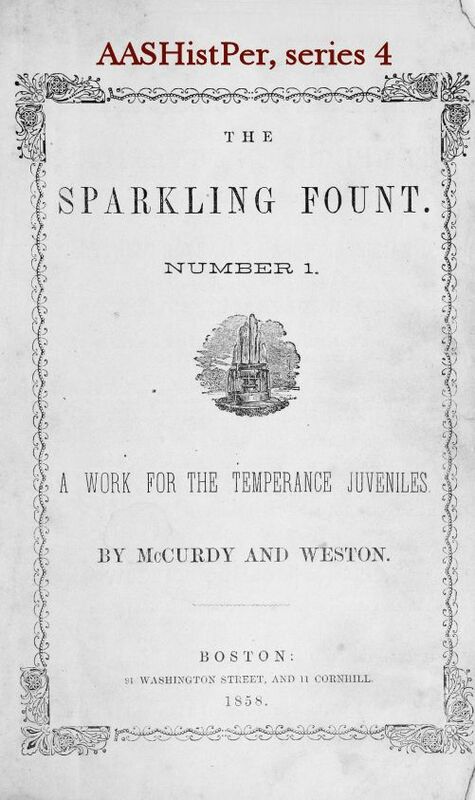 • “Youth’s Temperance Visitor.” Christian Ambassador 13 (24 October 1863); p. 171. • Notice. Maine Farmer 31 (29 Oct 1863); p. 2. • Advertisement. Zion’s Herald and Wesleyan Journal 35 (25 May 1864); p. 84. • Advertisement. Zion’s Herald and Wesleyan Journal 37 (7 Feb 1866); p. 23. • Notice. The Farmer’s Cabinet 64 (22 February 1866); p. 2. • Notice. The New-London Chronicle [New London, Connecticut] 17 March 1866; p. 2. 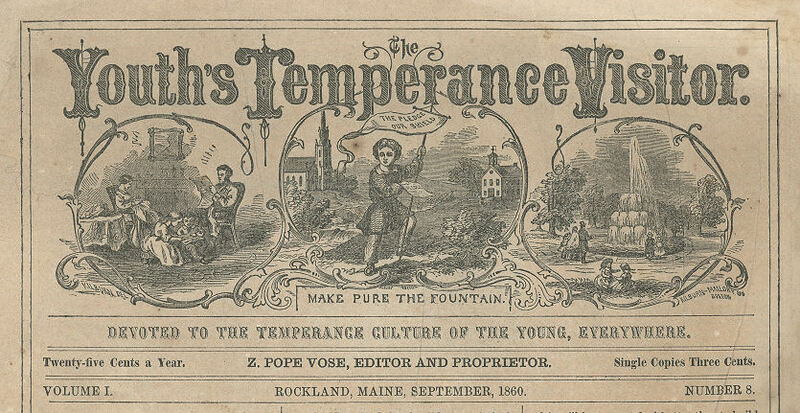 • “Youth’s Temperance Visitor.” The Universalist 1 (19 September 1868); p. 3. • Advertisement. Young People’s Helper. 10 (Jan 1872): inside front cover. • Twentieth Annual Report of the Proceedings of the Maine Press Association for 1883. Bar Harbor, Maine: Mount Desert Publishing Co., 1883; pp. 19. • Joseph Wood, comp. Proceedings of the Maine Editors and Publishers’ Association, for the Year 1866. Bar Harbor, Maine: Mount Desert Publishing Company, 1884; pp. 12-13. The Little Pioneer ; Jan 1860-1861? published: San Francisco, California: Hutchings & Rosenfield. relevant information: A story from the Pioneer, “Little Min-Yung and his Cat,” was reprinted in the California Farmer and Journal of Useful Sciences. • Advertisement. Hutchings’s California Magazine May 1860; p. 2. • “Something for the Children.” California Farmer and Journal of Useful Sciences 13 (3 Aug 1860); p. 174. • “Little Min-Yung and his Cat.” California Farmer and Journal of Useful Sciences 13 (3 Aug 1860); p. 174. 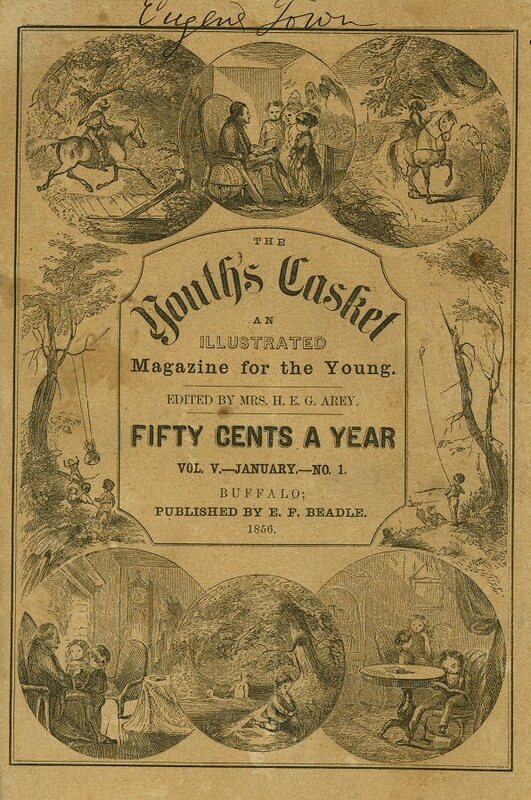 Youth’s Gazette ; Jan 1860-after 9 Sept 1865? 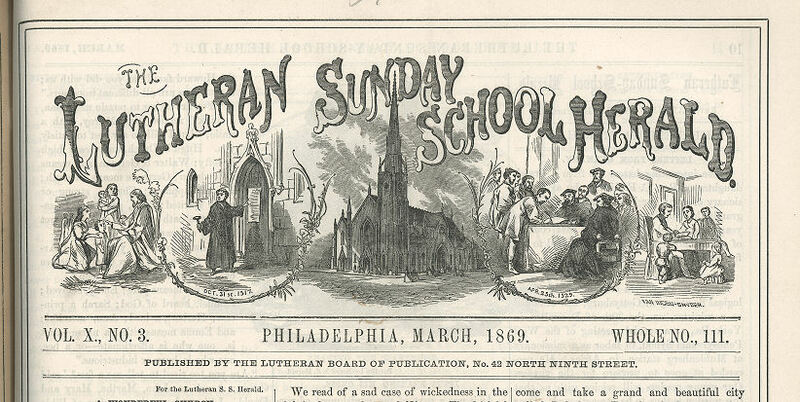 published: New York, New York: General Protestant Episcopal Sunday School Union & Church Book Society. description: 4 pp. ; page size, 14.5″ h x 10.5″ w.
• Advertisement. American Publishers’ Circular and Literary Gazette 6 (24 March 1860); p. 145. • Advertisement. The Round Table 4 (1 Sept 1866); p. 80. • Advertisement. The Round Table 4 (27 Oct 1866); p. 202.
published: Philadelphia, Pennsylvania: Lutheran Board of Publication; publisher at 42 North 9th St.
description: 4 pp. ; page size, 14″ h x 9.5″ w.
• Prices, 1864-1867: 1 copy, 25¢/ year; 6 copies, $1.25/ year; 10 copies, $2/ year; 25 copies, $3.75/ year; 100 copies, $12/ year. • Prices, 1868-Nov 1869: 1 copy, 25¢/ year; 6 copies, $1.40/ year; 10 copies, $2.25/ year; 25 copies, $4/ year; 100 copies, $15/ year. • Prices, Nov 1869-Aug 1870: 1 copy, 25¢/ year; 6 copies, $1.25/ year; 10 copies, $2/ year; 25 copies, $4/ year; 50 copies, $7.50/ year; 100 copies, $14/ year; 500 copies, $60/ year. relevant information: While intended for children, the paper included a few pieces intended for Sunday-school teachers. • Proceedings of the Third Annual Convention of the Synod of New York of the Evangelical Lutheran Church. Philadelphia: Lutheran Publication Society, 1910; p. 147.
published: Nashville, Tennessee: Graves, Marks & Co., May 1860-April 1861.
relevant information: Apparently referred to as “Youth’s Monthly Magazine” in 1860 and by Gilmer. • Description of visit to Nashville. DeBow’s Review and Industrial Resources, Statistics, etc. Aug 1860: 248-251; mention on page 250. • Betty Longenecker Lyon. “A History of Children’s Secular Magazines Published in the United States from 1789-1899.” PhD diss. Johns Hopkins, 1942; pp. 149.